Huntsville, Ala. — HudsonAlpha Institute for Biotechnology, a nonprofit genomics and genetics research institute, and the Donald Danforth Plant Science Center, one of the world’s largest independent plant science institutes, today announced a three-year project to expand and accelerate the development and deployment of advanced sorghum phenotyping and breeding technologies in support of improved varieties for smallholder farmers. The project is funded by a $6.1 million grant to the Donald Danforth Plant Science Center from the Bill & Melinda Gates Foundation. “It’s a pleasure to work with the Danforth Center on such an important project with potential for worldwide impact,” said Jeremy Schmutz, a faculty investigator at HudsonAlpha who leads the Institute’s work on the project. “We look forward to applying our plant genome sequencing and analysis tools to optimize sorghum, a critical crop for the socioeconomic stability and food security of people living in sub-Saharan Africa.” Schmutz is also the co-director, with Jane Grimwood, PhD, of the HudsonAlpha Genome Sequencing Center (HGSC). “The Gates Foundation recognizes that most smallholder farmers rely on small plots of land for food and income. This grant will help increase the productivity of a crop that can, in a sustainable and effective way, reduce hunger and poverty and make communities economically stronger and more stable over the long term,” said James Carrington, Ph.D., president of the Danforth Center. The funding broadens the impact of the TERRA-REF program launched in June 2015 by the Danforth Center with support from the U.S. Department of Energy’s Advanced Research Program (ARPA-E). TERRA-REF aims to optimize breeding strategies for improving the yield and stress tolerance of sorghum (Sorghum bicolor), a leading bioenergy feedstock crop in the United States, but also a critical source of nutrition for millions of people living in Sub-Saharan Africa. The Sorghum Genomics Toolbox, led by the Danforth Center with partners at ICRISAT (India), CERAAS-ISRA (Senegal), CIRAD (France), EIAR (Ethiopia), HudsonAlpha Institute for Biotechnology, Kansas State University, University of Arizona, George Washington University, and NRgene (Israel), is employing cutting-edge technologies to sequence and analyze grain sorghum genomes, capture tens of millions of phenotypic observations over the course of a growing season, and accelerate breeding efforts by connecting phenotypes to genotypes in the field. Sorghum is a member of the grass family and is grown worldwide. It is of interest, not only because it is a staple crop in Sub-Saharan Africa, but because grain sorghum yields have been flat or declining due to the lack of sufficient investment in the development of new improved varieties. 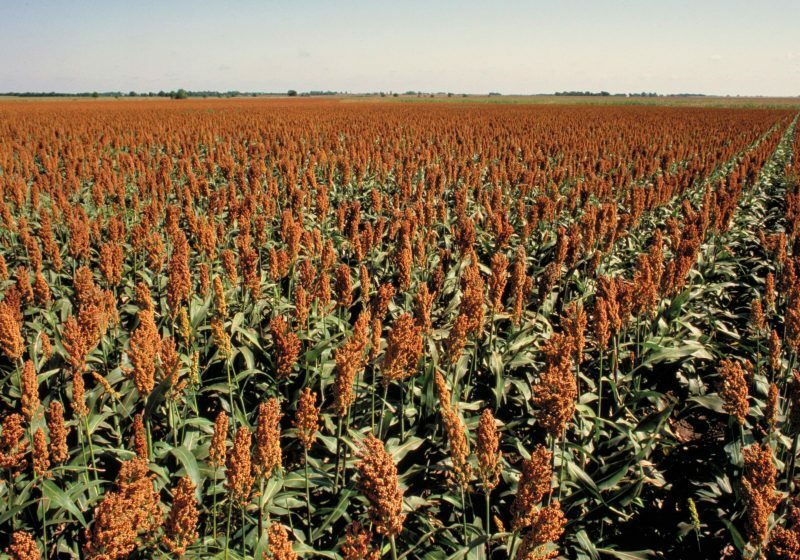 Sorghum is very resilient to drought and heat stress. Natural genetic diversity in sorghum makes it a promising system for identifying stress-resistance mechanisms in grasses that may have been lost during the domestication of related cereal crops. It is among the most efficient crops in conversion of solar energy and use of water, making it an ideal crop to target for improvement to meet the predicted doubling of global food demand by 2050. “The National Sorghum Producers is excited to see the additional investment into sorghum research and breeding which will help farmers around the world as they continue to deal with the challenges of advancing sorghum genetics to address climate variability and the needs for increased food sustainability,” said Tim Lust, chief executive officer of the National Sorghum Producers. About The Donald Danforth Plant Science Center: Founded in 1998, the Donald Danforth Plant Science Center is a not-for-profit research institute with a mission to improve the human condition through plant science. Research, education and outreach aim to have impact at the nexus of food security and the environment, and position the St. Louis region as a world center for plant science. The Center’s work is funded through competitive grants from many sources, including the National Institutes of Health, U.S. Department of Energy, National Science Foundation, and the Bill & Melinda Gates Foundation. Follow us on Twitter at @DanforthCenter.